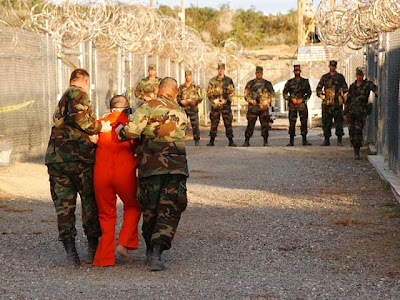 In a stinging rebuke of the Bush Government, a United States appeals court has ruled the US cannot imprison "enemy combatants," [scapegoats and patsy's for the Coalition of the Killing's resource war's in the Middle East], captured in Afghanistan, [held], indefinitely at Guantanamo Bay and deny them access to lawyers. In a strongly worded 2-1 decision, the 9th Circuit Court of Appeals said the indefinite imprisonment at the US naval base in Cuba was inconsistent with US law and raised serious concerns under international law. "The Government's position is inconsistent with fundamental tenets of American jurisprudence and raises most serious concerns under international law," judge Stephen Reinhardt wrote in the decision. "We simply cannot accept the Government's position that the Executive Branch possesses the unchecked authority to imprison indefinitely any persons, foreign citizens included, on territory under the sole jurisdiction and control of the United States, without permitting such prisoners recourse of any kind to any judicial forum, or even access [to] counsel." One of the San Francisco judges writes that it is the duty of courts to prevent the Executive branch from "running roughshod over the rights of citizens and aliens alike, especially in times of national emergency". A lower court is now obliged to hear arguments on behalf of detainees, [prisoners], and to make a ruling as to whether they should all be granted legal counsel. Only two of the 600 'prisoners' at Guantanamo have so far been granted access to a lawyer. The first was Australian, [scapegoat], David Hicks. The Pentagon overnight assigned a military defence lawyer to a second detainee, [prisoner], [scapegoat],Yemeni national Salim Ahmed Hamdan. Like Mr Hicks, he has not yet been charged with anything. On the Hicks matter, the Pentagon has pointed out today that it is giving Australian lawyer Stephen Kenny permission to speak on almost everything he is formally requesting. At a press conference yesterday, Mr Kenny said he was limited in what he could say. Today, the Pentagon says it only withheld approval for two items relating to security.